The old flood defences varied in height and many were coming to the end of their design life. The new defences are formed of embankments, sheet pile walls, rock revetments, flood glass, and property level protection, and are designed to last for 100 years, with the option of being raised further to add even greater protection into the future. As part of the project, the Environment Agency has also improved public footpaths along the route of the defences. The Environment Agency has worked closely with partners and the local community to build and upgrade 7 kilometres of new and existing flood walls, embankments and other defences, bringing greater peace of mind to thousands of homeowners and well over one hundred businesses in the local area. I’m delighted to see the Shoreham Adur Tidal Walls flood scheme open, protecting over 2,000 homes and businesses and supporting crucial local infrastructure including Shoreham Airport. With £37.4 million of government investment representing over 80% of the total cost, the project showcases the very best of partnership working, demonstrating how government can work with its valued partners to continue to support local communities from flooding. This Government is committed to boosting economic growth across the whole of the UK and building a Britain fit for the future. 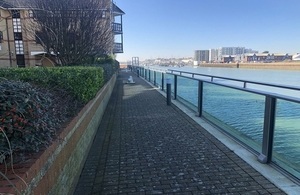 Protecting businesses from the impact of extreme weather is vital so it is good to see how Coast to Capital have worked with the Environment Agency to fund the reinforcement of flood defences along the River Adur. This will not only protect Shoreham harbour and airport but will also unlock the area for housing developments and employment space, supporting the local economy and opportunities for local people. Flood prevention is such an important issue and I would like to congratulate the Environment Agency and the project’s partners on the successful completion of this major scheme for Adur. The Adur Tidal Walls scheme will have an immeasurable impact on the residents and businesses in Shoreham and Lancing. It will not only will protect our communities from future flooding but it also gives investors certainty, supporting the creation of new homes and workplaces while opening up the riverside to local residents. I want to thank the Environment Agency and their contractors for the work over the past couple of years. The complex scheme has presented a number of challenges and there is still the issue of completing the defences at the Sussex Yacht Club site to resolve.